Wonderful day! What a way to start the trip! Door to door visitation – which I positively hate in the UK, as it’s so generally unproductive – was so wonderful in Los Lagos today. We were with the church Oasis de Restauracion, pastored by the lovely Wilson and Luz Eneth Monroy. Los Lagos has a ‘reputation’ even within the city, so, humanly, it’s possible to think you might have someone put their head round the door, and chat…or you might get something perhaps more metallic aimed your head! When we arrived, it was wonderful to Wilson: just three months ago, I prayed for him in his church: he was ill, suffering with depression, and panic attacks. This is a great man of God: a wonderful Pastor, Bible Teacher, and a key man in God’s move here in this city. The enemy, invariably, in my experience, attacks the strong, and frequently at our strongest points. Today, Wilson looked a new man. Thank you, Jesus. Luz, his wife, asked I remembered praying for their son, Stephen: he had major eye trouble: not just a ‘lazy’ eye, but one that did its own thing, and he was losing sight generally (he’s about 14/15 years old), and optometrists had said there was nothing that could be done. I was blown away when Luz told me that he’d specifically asked for me to pray for him: I don’t have anything others don’t have (maybe I use them a bit more than others? I don’t know…). When he next was seen by the optometrist, his eye was totally ok, and his sight restored even beyond what it had been when the ‘affliction’ hit him as a child…. God’s so blooming marvellous! Andreas and Kristin were paired off with a terrific young man, Daniel 13, to translate, and a lady from the church to give a Bible as a gift for the person/family, and to get information for follow up. I was with a lovely lady called Nayib to translate, and Sandra…. The first house made me a little unsure of God’s sense of humour! – the lady came to the door, a face peered through a gap, full of fear, eyes troubled. For a few minutes, it seemed evident that she wasn’t going to invite us in: so I told her why I was there, in her barrio, in Los Lagos: because God, and Jesus, love me so much, that I want to tell others, and that I love her country because God loves its people, and has a unique and special love for her. Then the door opened, she invited us in: the two ladies with me went in first, and I looked up…and up…and up – at a massive double staircase, about 30-35 concrete stairs, narrow treads, deep….and thought… does God want to save her more than I don’t want to attempt these stairs with a pair of knees that rebelled at the sight of them!! (Joke, ok!!)…. I told them NOT to pray the prayer if they didn’t want to, weren’t going to mean it…but they all did, Elsy too, all ten that were in the house. It was a special few minutes…. I then had the chance to pray for healing for Marlon and Elsy: I hope the church follow them up, and find out about their healings! We were with them about 90 minutes: some of the garbage that ‘church’ and other religions have taught is unbelievable! Maribel asked if I was married or single: when they knew I am single, Marlon said ‘So according to the Bible, then, you’re going to hell!’ Perhaps I ought to find a wife quickly, after all…. !! The ‘big’ family – well, some of them! 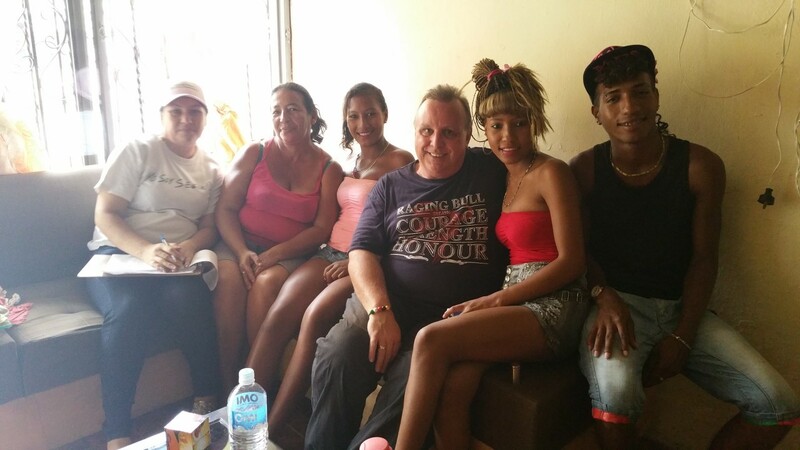 – Marlon and Maribel nearest the camera, and er…others! 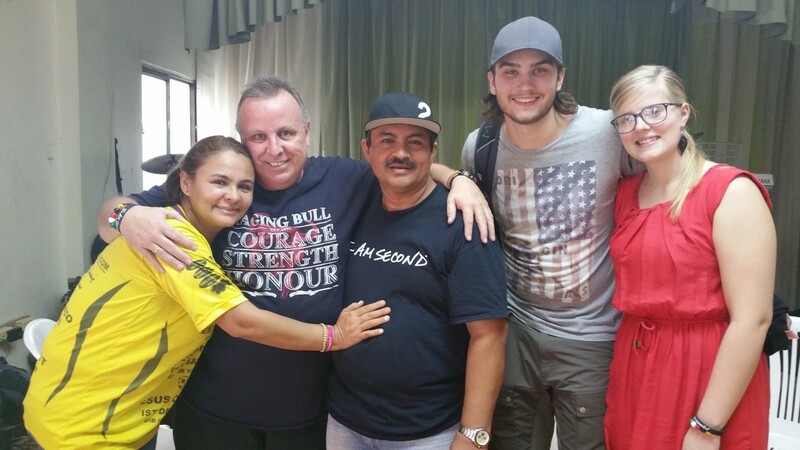 We were in Los Lagos about 5-6 hours… Andreas and Kristin saw people healed, and saved: I love it when God does ‘wonders’ for guys that come with me right at the outset: they already have strong faith (they did 2 months in Pemba, Mozambique, with Rolland and Heidi Baker – I’m in awe!) – but to see miracles on day one of ministry sets the tone for the trip! They’re loving it…. This evening, I stayed behind as they went off with Wilmar to his church to do a 3 hour kids event: not my forte, if I’m honest…so what happened there will be in tomorrow’s blog. I stayed behind, too, to give the old knees a breather – yesterday I had needles stuck in the right knee, after a doctor, recommended to me, saw the x-rays he took… I have to say that they are ‘impressive’ knees, if completely wrecked is impressive! Tuesday, he sticks needles in the left one… I’m not a lover of steroids/cortisone, but boy, does it make a difference, if only short term! Broken hearted, today, to read of the night-club fire in another of my ‘loved homes’ – Bucharest, Romania L – 28 dead, 140 injured… tragic, as they are all so young…. 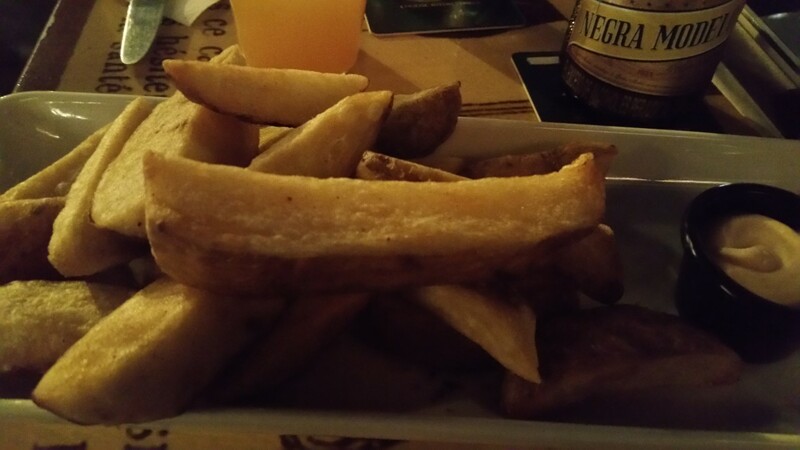 The big chip sailed on the alley alley o… Possibly the biggest chip I’ve ever seen on my plate last night, about 4 inches/10 cms! « Cali: the big kick-off!